We’ve reached the point in the year where traditionally no-one releases serious music; it’s all about seasonal tunes and greatest hits for the dad market, so it’s really refreshing to hear another contender for High Fives 2016 (coming soon with even more guest contributions) released in November. 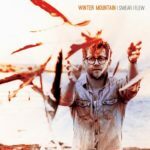 Winter Mountain is the nom de guerre of Joe Francis and “I Swear I Flew” is his second album. Let’s get this out of the way right now, it’s a stunningly powerful and beautiful piece of work packed with ethereal and evocative songs, blowsy and blustering songs, and intricately woven arrangements mostly played by Joe, but helped out by Seth Lakeman and a few others. I think it might even be new genre; Kernowcana, anyone? “I Swear I Flew” is a potent cocktail, mixing up influences from the great late twentieth century American songwriters with twists of Celtic and English folk styles. It’s all blended perfectly to create a confection that feels smooth on the surface but has plenty of bite underneath. Even the quiet, contemplative songs have a widescreen feel to them; the breathy vocal on “Dragonfly” is underpinned by delicately picked acoustic guitar, bass and cello, but the sound is full and resonant. By way of complete contrast, the next song, “Before the Flood” features a full band (and then some) with thudding bass and drums and then keys, harmonica, fiddle, tenor guitar, banjo and pedal steel. And it’s all topped with a great vocal performance that has a few hints of Don Henley at his very best; it’s a big, beautiful beast of a song. No filler at all here, and definitely a couple more to single out for attention. “The Morning Bell”, which gives the album its title, is (almost) a solo acoustic lovelorn ballad packed with the natural imagery that permeates the album, contrasting starkly with the full band songs. “Fireworks Night” (Promises we Make) is an absolutely gorgeous five minutes that pulls off the spectacular trick of starting like Springsteen and morphing into what I can only describe as a stripped-down acoustic version of The Blue Nile. I defy you to remain unmoved. This album is inspired by the greats of rock, roots and folk, twisted together until they form something shiny, beautiful and new. It’s a lovely piece of work. “I Swear I Flew” is released on Friday November 18 on Astral Fox Records.